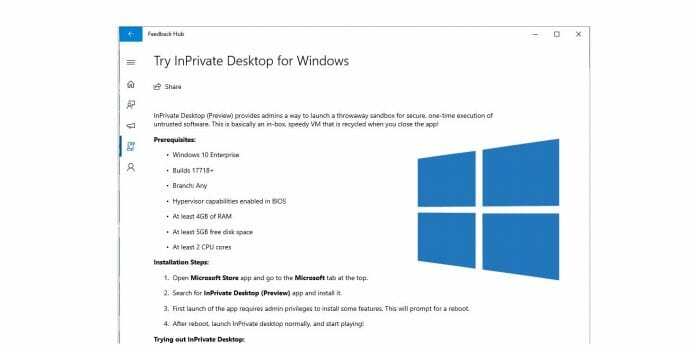 It seems like Microsoft is looking to add a new security feature in Windows 10 (Enterprise) that it calls “InPrivate Desktop”. This possible upcoming new security feature was initially discovered by Bleeping Computer who captured it with a screenshot that contained relevant details from the Microsoft Feedback Hub. However, it has now been removed from the Windows 10 Insider Feedback Hub quest. For those unaware, Sandbox is a security mechanism for separating running programs, usually in an effort to mitigate system failures or software vulnerabilities from spreading. It is often used to execute untested or untrusted programs or code, possibly from unverified or untrusted third parties, suppliers, users or websites, without risking harm to the host machine or operating system. It appears that Microsoft is planning to strengthen the Windows Defender on Windows 10 with native sandbox support and it is looking to target Windows 10 Enterprise starting with build 17718 for all branches. The ‘InPrivate Desktop’ requires at least 4GB of RAM, 5GB of free disk space, 2 CPU cores, and CPU virtualization enabled in the BIOS, and hypervisor capabilities enabled in the BIOS. See the reproduced image below for more information.